Archaeologists have found that the original Stonehenge was a graveyard for a community of elite families built 500 years earlier than the site we know today. The British team, which was led by Professor Parker Pearson (UCL Institute of Archaeology), analysed the ancient remains of 63 bodies buried around Stonehenge, finding that the first monument was originally a graveyard for a community of elite families, whose remains were brought to Stonehenge and buried over a period of more than 200 years. "The first Stonehenge began its life as a huge graveyard," said Professor Parker Pearson. "The original monument was a large circular enclosure built 500 years before the Stonehenge we know today, with the remains of many of the cremated bodies originally marked by the bluestones of Stonehenge. We have also discovered that the second Stonehenge was built 200 years earlier than thought, around 2500 BC." 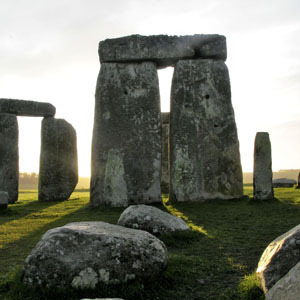 "Stonehenge was a monument that brought ancient Britain together," said Professor Parker Pearson. "What we've found is that people came with their animals to feast at Stonehenge from all corners of Britain - as far afield as Scotland. Stonehenge was built soon after the appearance of the first pan-British culture, the only time in prehistory that the people of Britain were unified." For years the reasons for Stonehenge's location have also remained a mystery, but the team now think that the site was chosen because of a pair of naturally-occurring parallel ridges in the landscape - the result of Ice Age meltwater - which coincidentally point directly at the Mid-Winter sunset in one direction and the Mid-Summer sunrise in the other. To our ancestors, this must have seemed an uncanny and auspicious sign - and we now know that they chose to build their cemetery at the end of them. Once completed, Stonehenge declined after two centuries. For years, this decline has been a mystery. But Professor Parker Pearson believes that it is explained by the culture of the 'Beaker People', known to have arrived in these isles around this time. He believes that their greater individualism and new material goods, including the first metal goods seen in Britain, put an end to the communal culture for which the monument had originally been created. "In many ways our findings are rewriting the established story of Stonehenge," said Professor Parker Pearson. "What we've uncovered is compelling evidence that Stonehenge once united the people of Britain, attracting people from far and wide for Solstice gatherings, but also that the bodies and grave goods found on and around the site also offer an answer to the mystery of Stonehenge's decline."